This feasibility study and master plan will pick up where the Chester Valley Trail Extension to Downingtown study leaves off and will identify and evaluate potential routes for extending the Chester Valley Trail (CVT) westward across the county to connect with the future 29-mile multi-use Enola Low Grade rail trail located just outside of Atglen Borough in Lancaster County. The study will also identify potential linkages to nearby points of interest and will examine "Trail Town" precedents for using a long-distance multi-use trail to spark recreation-centered economic development. 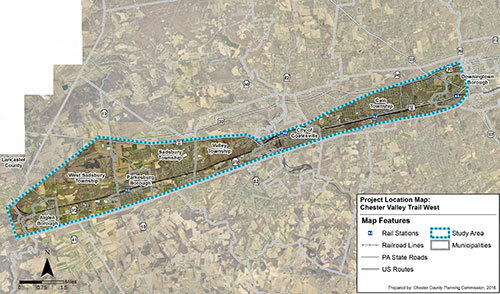 The project study area includes eight Chester County municipalities: Caln Township; Downingtown Borough; City of Coatesville, Valley Township, Parkesburg Borough, Sadsbury Township, West Sadsbury Township, and Atglen Borough. The CVT West study was funded in part by the Pennsylvania Department of Conservation and Natural Resources (PA DCNR) Community Conservation Partnerships Program (C2P2). For more information, please contact Rachael Griffith, CCPC's project manager for the study, at 610-344-6285 or rgriffith@chesco.org. The study included three public meetings where interested members of the public were invited to participate in determining the alignment for the trail. The second public meeting was held on March 1, 2018 at the The Point in Parkesburg.